Since yesterday's picture of Shaggy clocking the Joker was so well received, let's complete the diptych with one of Scooby laying his paws on the Penguin. Dogs lack the manual dexterity to make a proper fist! Although, now I'm tempted to throw the Blue Falcon and Dynomutt into a supers rpg. Awesome. My mom made me a Dynamut Halloween costume when I was a kid. My own boys still play in it. 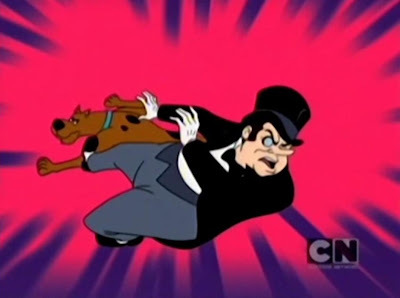 I want one of Scrappy Doo being beaten up by a supervillain - I hate that puppy. Catwoman vs. Josie & the Pussycats! I think Bizzaro Superman should take Scrappy Doo as his superdog. "I will hug him and feed him and call him Skrapto!" James: in the previous discussion you wanted a source confirming we were getting a third season of BATB between now and cancellation. Here's a report from the con panel where the cancellation was announced. Now THAT'S a Scooby Snack,or should I say A Scooby SMACK. A diptych is just a poor man's triptych. I feel cheated. This is all I've ever wanted. If mass is destroyed by going into Scooby, that would explain a lot about how those sandwiches fit into the stomachs of him and Shag.